Nothing brings people together like adventure! 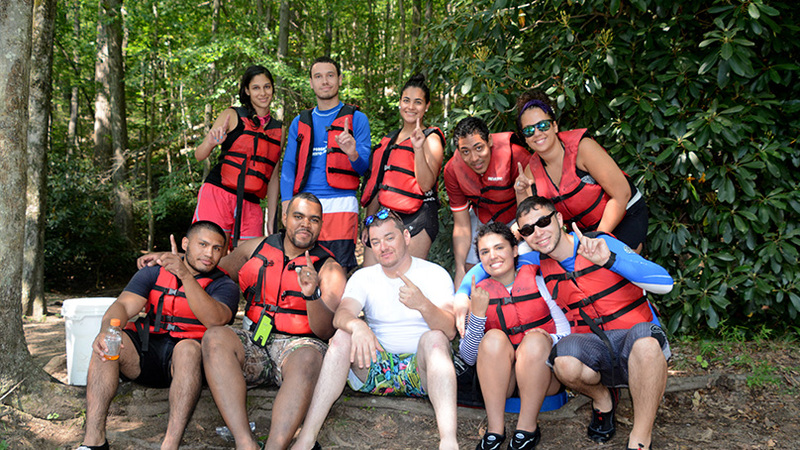 Whitewater Rafting Teambuilding energizes and unifies any group. Building your staff into a strong team that works together is essential in today’s competitive environment. 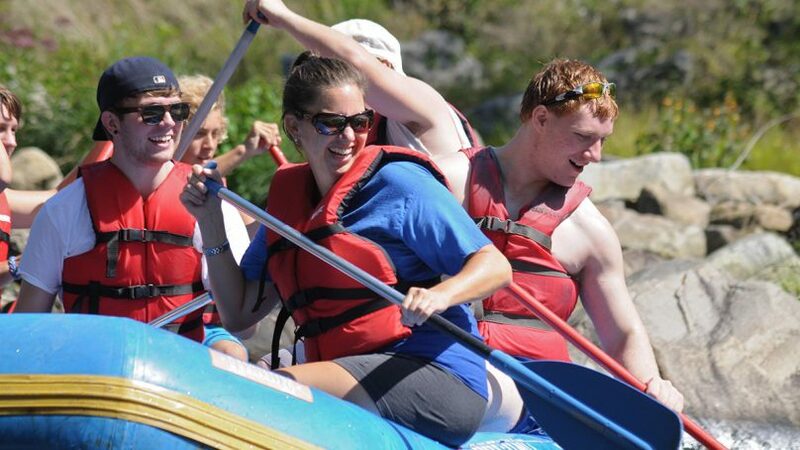 Whitewater Rafting helps strengthen communication and leadership skills, sparks creative energy and builds camaraderie… all while having fun in the great outdoors! Our team building programs are customized based on your needs. We offer everything from an easy day on the river with corporate invoicing, to light teambuilding with on-river activities, to in-depth programs featuring both classroom style and outdoor events. Our whitewater rafting adventure includes 8 miles on the Lehigh River. 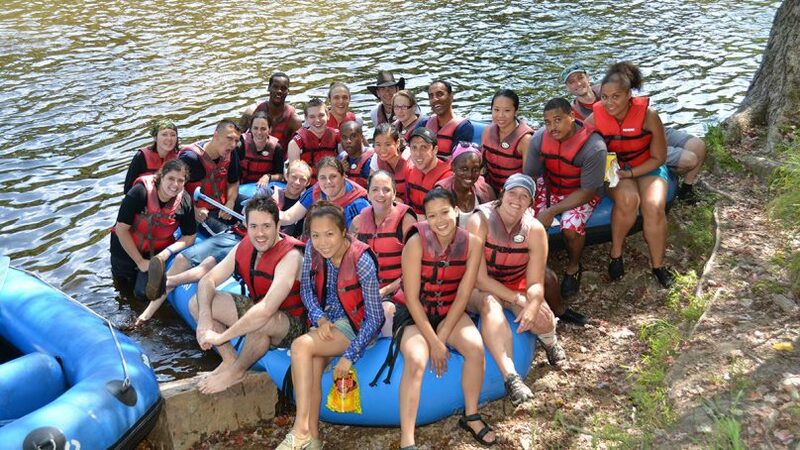 Why Pocono Whitewater Rafting Teambuilding? 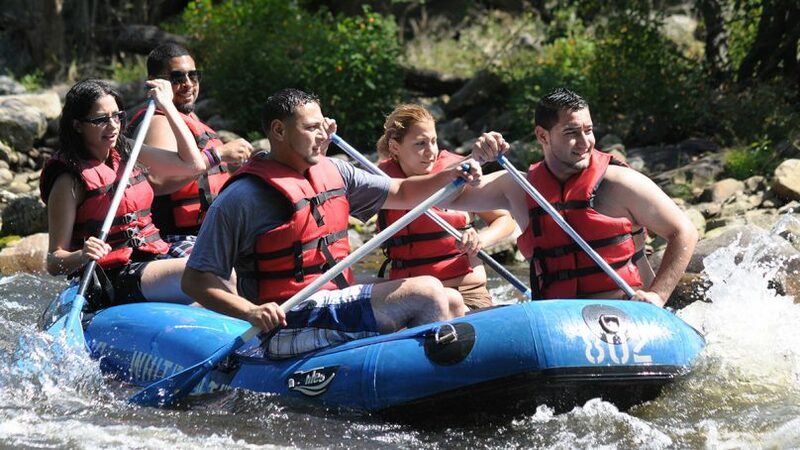 Private Trip– Raft 8 miles down the Class I & II rapids of the Lehigh River with ONLY the people you choose! At least 10 participants required. Customized itinerary! Looking for a relaxing day on the river with your office, no problem! Want team building drills and activities, we have that covered! You tell us what you are looking for and we will make it a reality! Facilitator Provided– Whether you want teambuilding drills or just a private trip down the river we will send you out with a Facilitator to keep the team on track and lead any activities that the group may want. In addition, you will be with trained river guides to make sure everyone is staying safe and enjoying their day! Looking for a way to top off your day? Food and beverage packages are available! Pocono Whitewater has a full liquor license and kitchen with hot food options. Purchase a photo package and receive photos of each raft as well as a group shot to prove you didn’t just skip work for the day! Transportation packages available from all local resorts. Call 1-800-WHITEWATER (944-8392) for more information. Looking for a teambuilding activity that doesn’t involve water? We also offer teambuilding packages with our two sister companies Pocono Biking and Skirmish Paintball! Give us a call at 1-800-Whitewater for more details! If you need help getting your group together, no worries! Just give our group sales coordinator, Debbie Y, a call at 570-325-8430 extension 114. 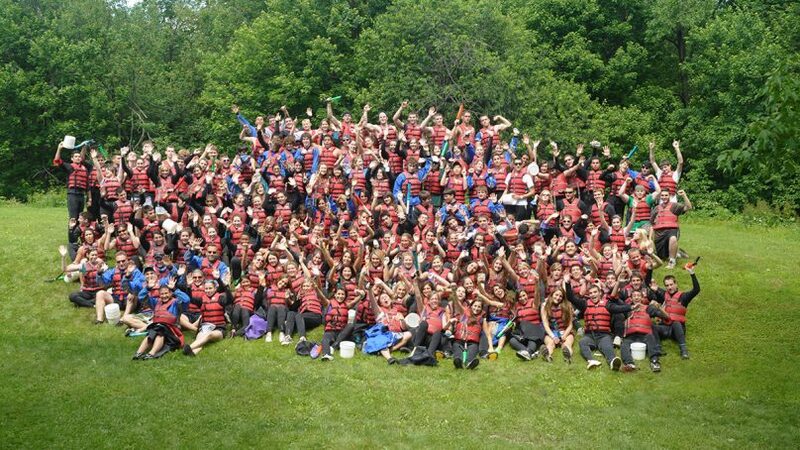 Rate Includes: Lunch, all necessary rafting equipment, life jacket, free parking, change rooms, shuttle service to/from the river & professional teambuilding facilitator, post-program award ceremony, corporate invoicing. 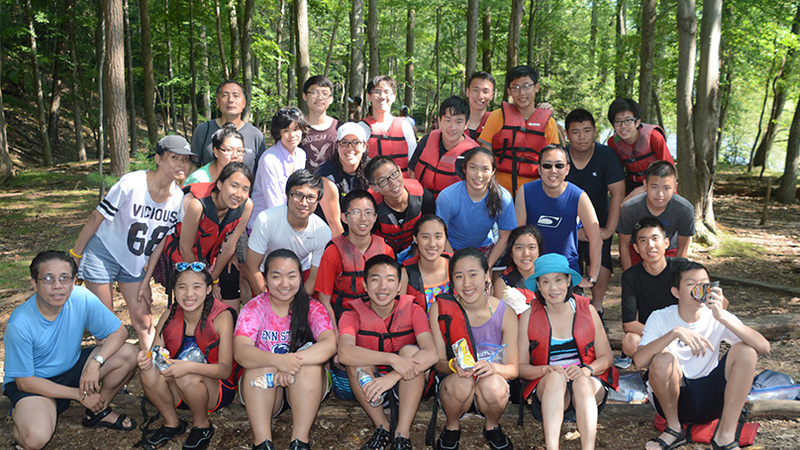 Trip Notes: Teambuilding trips are available for groups of 10 people or more. Each raft will accommodate 4 to 6 people. There is a minimum of 10 people required for whitewater teambuilding. 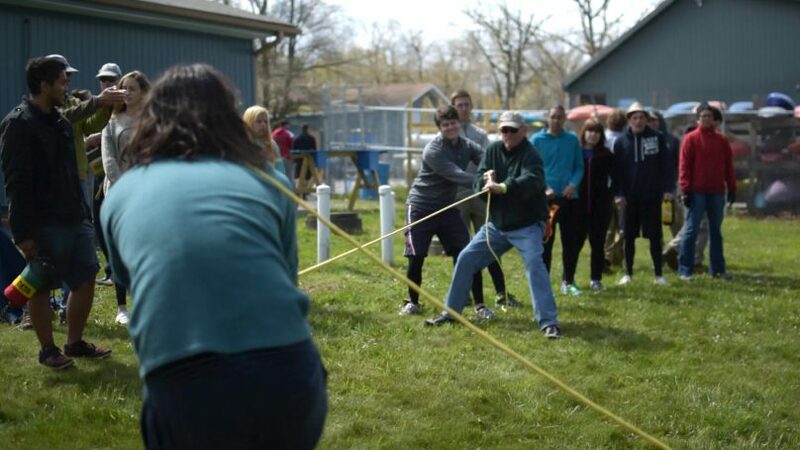 Remember, whether your objectives are serious teambuilding or a day of fun and camaraderie with a touch of teamwork thrown in, we have the program for you. Your entire day is tailored to the specific needs of your group. Customized breakfast and dinner packages are available. If you forget something you can pick it up in our retail shop. Your photo is taken on the river and available for purchase in our store or online at PoconoWhitewaterPhotos.com. Group Photos are also available. We also offer Skirmish Paintball as an alternate teambuilding option.